The community councils created by the State Scenic Rivers Act play an integral role in the DNR's efforts to protect these beautiful public resources. Drawn by the rush of a nearby waterfall, a fisherman emerges from a wood of hemlock and rhododendron beside a gurgling whitewater river, miles from the nearest paved road. Mayflies skim the surface of a downstream pool, and as the fisherman makes his way along the bank, the shadow of a trout flashes across the river's pebbly bottom. Launched in the tailrace below the hydroelectric dam, a team of rafters drift through a suburban forest toward the largest city in the state. Sunbathers sprawl across giant gray boulders near the banks and dip their toes in shallow whirlpools, but the deeper water gushes faster, splashes higher, rushes louder, drawn by the approaching rapids. 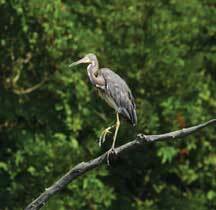 An amateur birder paddles a canoe across the placid water of a wide tidal river. The cordgrass sways in a warm breeze, darkening with the passage of afternoon clouds. 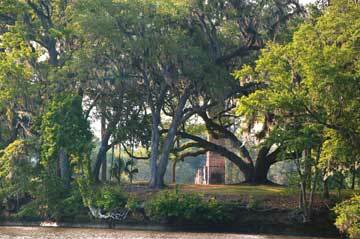 Gnarled oaks and massive magnolias lean in from the sunlit lawn of a plantation along the bank. At the bend downstream, a great egret tiptoes out on a pluff mud spit before lifting its head, spreading its wings and taking flight. 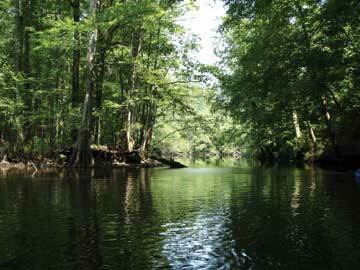 South Carolina's rivers are as diverse as the people who enjoy them and the wildlife they sustain. 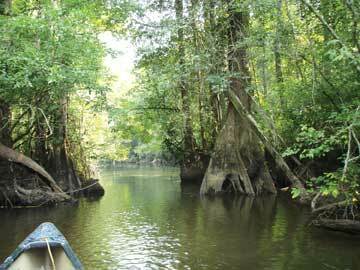 They provide not just energy and fresh water, but remarkable corridors of natural beauty, distinguished by riparian forests, black water cypress and tupelo swamps, salt marsh sanctuaries and class V whitewater rapids. 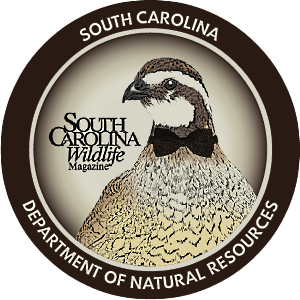 That's why, more than twenty years ago, the state legislature passed the South Carolina Scenic Rivers Act - to identify and protect some of our most precious natural resources through community involvement and constructive dialogue facilitated by the S.C. Department of Natural Resources. Through the program, DNR-led advisory councils have helped mitigate the effects of riverfront development and worked to reduce pollution, educate the public and improve river access on designated scenic rivers across the state. Since the Scenic Rivers Act went into effect in May of 1989, sections of ten rivers have received the designation, including a pristine five-mile stretch of the Middle Saluda located entirely within Jones Gap State Park, and a 102-mile stretch of the Lynches River that winds through pine forests, farmland and blackwater swamp. Other officially recognized stretches include parts of the Catawba, the Ashley, the Broad, the Black, the Lower Saluda, the Great Pee Dee and two separate segments of the Little Pee Dee. Each designated corridor is overseen by a ten-person advisory council chaired by a DNR representative. Councils are composed of conservationists and other stakeholders, including representatives from area industries, though the majority of the members are riparian landowners. Together, these councils draw up river management plans which, as required by law, consider the specific land management concerns of all involved parties. Once a plan is in place, council members respond to that river's unique needs as situations arise. Unfortunately, multiple rounds of state budget cuts in recent years mean those rivers may not get the attention they've enjoyed over the past twenty. A program that once employed nine full-time agents, educators and researchers now employs a single coordinator who receives assistance from DNR staff working in other areas. 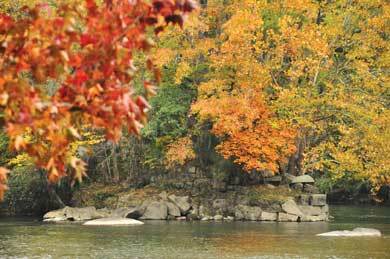 Moreover, as the program observes an officially-mandated moratorium on adding new waterways to the scenic rivers list, a waiting list of other rivers and other communities that would benefit from Scenic River status grows longer. It's no secret that our rivers are under a tremendous amount of stress and have been for years. As South Carolina's population continues to grow, threats to the river system can only increase. According to Bill Marshall, a program manager in the DNR's Land, Water and Conservation Division and Chairman of the Lower Saluda River Advisory Council, the state's rivers already face significant threats from development and point-source pollution (with spills from wastewater treatment plants being a major contributor), as well as nonpoint-source pollution (such as stormwater runoff) that finds its way into our waters, even in rural areas. "When a watershed gets covered over by asphalt and houses get built, the water that used to slowly soak into the soil before making its way to the river doesn't do that anymore," Marshall explains. 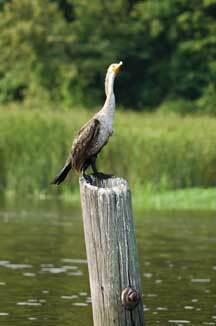 "It hits those hard surfaces and rushes all at once into the creeks and into the river itself. It blows out all the feeder streams, so they become unstable and aren't as ecologically functional as they used to be. And then, of course, you have all the pollutants from the roads, the oil and grease, and from the land, the chemicals, fertilizers and pesticides." In other words, river pollution isn't just the problem of the people living along the rivers or of the industries operating in their immediate proximity. "With nonpoint-source pollution, every human being is responsible," DNR State Scenic Rivers Program Coordinator Mary Crockett explains. "It comes from what we put on our yards, how much nonpervious surface area we develop and what we bring to the river when we recreate." Of course, our rivers also face other threats. Logging is a major concern, says Crockett, particularly along rural rivers. When private investors buy riverfront tracts, they often sell off the timber to help finance the purchase. The loss of that old-growth timber buffer can lead to increased erosion, particularly in the more mountainous terrain of the piedmont. Logging can also disturb a river's scenic profile, though Crockett describes that as a more temporary problem. "Those areas will be green in ten years and on the road to recovery," says Crockett. "That's one nice thing about the South - vegetation grows back quickly. In five years, if you paddled past those areas and didn't know what had happened, you wouldn't notice. It would still be scenic, just not quite as impressive as the old-growth trees were." But the erosion that occurs in the meantime can affect the adjacent river for years to come - in ways that aren't so easily seen or remedied. Creating buffer zones between logged areas and the water's edge, one goal of the Scenic Rivers program, can help alleviate this problem significantly. Of course not all scenic rivers are located in rural areas. Rivers like the Lower Saluda, the Ashley and parts of the Catawba run through densely populated regions, qualifying them as urban rivers - which means they face a variety of unique issues simply because of where they are located. "An urban river will have different pressures on it," says Marshall. "There are issues related to the physical nature of the watershed, and there are differences just in terms of the number of people. You've got the benefits of people using the river, and then you've got the problems of people using the river, so it's sort of two sides of one sword." Malcolm Leaphart, who has represented the conservation group Trout Unlimited on the Lower Saluda River Advisory Council in Columbia since its inception in 1991, knows that stretch of river intimately. Over the past twenty years, Leaphart and fellow council members have monitored everything from the discharges of Midlands-area sewage treatment plants to oxygen levels in the river, both of which have improved as a result of the council's efforts. The Lower Saluda Council has also worked to educate developers about the need to maintain wooded buffers along the banks and properly manage runoff with silt fences and sedimentation ponds. In some cases, the council has successfully pushed for tighter regulations at the county level, though in other cases council watchdogs have been able to reach a compromise with developers and industries. "It's really up to the counties to decide if they're going to have riparian zones and sedimentation laws," Leaphart explains. "But the council has provided a wonderful forum, and I think that's the key. It's a forum to bring together different groups, so it's not just Trout Unlimited saying 'don't cut the trees down' or 'don't muddy up the river.' We've got everybody on board, from Riverbanks Zoo to SCE&G." Another issue the council has been actively pursuing concerns working with SCE&G to manage outflows from the utility company's spillway at Lake Murray, which at times can cause this nine-mile segment of urban river to turn extremely wild with little advance warning. Whereas the Lower Saluda Council aims most of its efforts at monitoring sewage releases and sedimentation and pushing for better river safety, members of the Lowcountry's Ashley River Advisory Council focus largely on making sure property owners keep dock construction within the guidelines spelled out in the special area management plan they helped draft. "We have a really good balance of not only going against things, but also being really proactive, so we're not just that group that says 'no, no, no, you can't do this, you can't do that,' " says council member Emily Pack, who represents historic Drayton Hall Plantation. "I think in any type of advocacy work you have to strike that balance if you want to be successful in the long term." And the Ashley River Council has been very successful, says Pack, who credits the DNR's involvement with giving the council legitimacy - even as the department's overall presence has fallen off somewhat due to budget restraints. 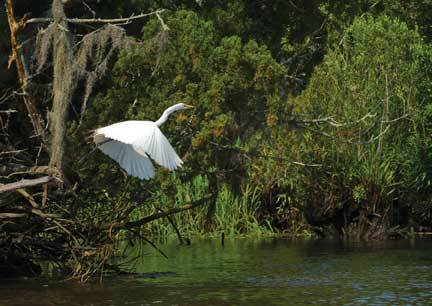 "Being a part of DNR makes people think, 'Oh, the Ashley River is part of the Scenic River program,' so it has more weight in people's perception," Pack explains. "Now we've been around long enough that no matter what, I hope people would still listen to what we have to say." The kind of recognition Pack describes is critical going forward. While the Ashley River hasn't faced much in the way of large-scale residential or commercial development since the '90s, the council's work is far from done, particularly when it comes to people's ability to access the river. 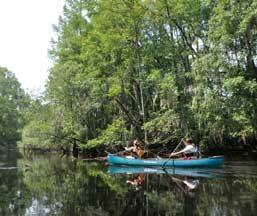 "Access to the Ashley River is actually not that great," Pack explains. "There aren't that many places to put in a kayak or boat, for example. It's one of the things we're working on. If you want somebody to protect something, they have to love it. If they can't get out on it, they're not going to feel like it's a part of their community." Crockett agrees. And while she stresses that the state is doing everything in its power to protect its natural resources, she says the scenic rivers of South Carolina belong to everyone, and public access is critical to building support for river conservation efforts. In short, people value most what they can see and experience. "Not everybody can live next to the river,"says Crockett. "So in order for people to have that connection to the river, you've got to have parks, walkways and access points so people can canoe, kayak, motorboat, go tubing, swimming, fishing or just walking the banks." As for the future of the State Scenic Rivers program, despite budget constraints and a much smaller staff, Crockett is upbeat. She'd like to do more for the rivers already in the program and see new rivers become a part of it. Realizing that goal, particularly in these difficult budget times, will require more volunteers like Leaphart, Pack and the hundreds of other citizen-conservationists who have given their time and energy to the Scenic Rivers program during the last two decades. 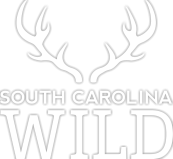 Luckily, another natural resource that South Carolina is blessed with is volunteers willing to help the DNR with the conservation of our waterways. Craig Brandhorst is a Columbia-based freelance writer. This is his first assignment for SCW.